The priest, like all Christians, is called to follow in his master’s way, to become one with the risen Lord. However, as a result of his call, a special responsibility is imposed upon the priest to perfect his life as a disciple. Priesthood is not a function but an identity, a sacramental conformity to Christ the Priest. Hence, the priest must, first of all, be a solid and mature Christian. The priest is a disciple who has received a special call. This call is one that is stirred up from within by the Spirit dwelling within him and then affirmed, reinforced and formalized by the external call of the Church, through his Diocesan Bishop or Religious Superior, under the guidance of the same Spirit. A man is called to be a builder of a community of believers, to affect the oneness of the people with Christ and each other, to deepen the oneness and to guide its expression in Christian living. He carries out this work as the helper of the Bishop. The priest’s life is essentially a life of service of Christ. Because of his service of Christ, the priest is also called to serve his fellow human beings, the Body of Christ. The primary means by which the priest effects, deepens and guides the oneness of the Christian community is through the sacraments. The Eucharist has a unique place among the sacraments. As the presider of the Eucharistic assembly, the priest speaks in the name of Christ and of his assembled brothers and sisters, who celebrate along with him and through him. The celebration of the Eucharist is both the goal and the climax of all the activity of the priest, and also the source of his other responsibilities. The proclamation of the Word is an integral part of the life of the priest, since he is responsible for all aspects of the sacraments, presides over their celebration by the people of God, and guides the people of God in living out the mystery of Christ which they contain. By “the Proclamation of the Word” is meant the priest’s whole ministry of pastoral service, teaching, preaching and sanctification. It is especially this ministry of the Word which is subject to much change. What is involved will vary from age to age and from place to place, according to the culture and the needs of the people whom the priest serves. It is a matter of methods and means, of finding the ways to the human heart in changing times. This is part of the priest’s life which must be continuously evaluated and open to change, and in light of which seminary formation must be constantly reevaluated. 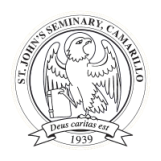 In the light of the above, the purpose of St. John’s Seminary may be more clearly described as the task of aiding men, who believe that they have been called by God to be priests, in their personal growth to be mature Christians in order that they may be effective builders of a Christian community through the ministry of the sacraments, especially the Eucharist and of the Word. To achieve this purpose, the seminary has four major formational programs: human formation and evaluation, spiritual formation, intellectual formation, and pastoral formation and field education. Among these programs, the human and spiritual formation programs are central and have priority. They are central in the sense that all the other formational programs must be integrated and contribute to them. They have priority in the sense that spiritual and human growth is the most important area of activity in the seminary. Since St. John’s Seminary is preparing most of its students to serve as diocesan priests in the communities of the southwestern United States, it must be aware of the cultures and needs of these communities. A seminary cannot hope to prepare men to be experts and sensitive to all of these cultures, but it must seek to make its students aware of these cultures and give them the basic tools to serve effectively in any of these areas in any of the diocesan ministries. Because of the makeup of the population of the southwestern United States, special attention must be given to preparing men to work with people of Hispanic background. Since the Church, as a human institution, is constantly growing and maturing, and the makeup of its communities changing, St. John’s, as any seminary, must encourage and aid its students to be flexible and adaptable to new and/or different structures, peoples and needs. The Church is not a clerical institution wherein the roles of ministry and leadership are found exclusively in those ordained to priesthood. The Holy Spirit continues to bestow innumerable and diverse gifts on all the members of the Body of Christ for building up the kingdom of God and organizing the ministry of the Church. Seminarians must learn to work in collaboration with all whom the Spirit calls to service and leadership in the diverse ministries of the Church: women and men, the young and the old, the disadvantaged and the advantaged, the poor and the rich. In collaboration, the priest is called not only to serve the needs of all, but to exercise his own gifts of discerning and empowering the gifts of all the faithful. To continue to develop and mature in a personal relationship with Christ and His church through Prayer and Spiritual direction.